The guys over in the Leica, Contax and Nikon forums can't have all the fun. Let give them something to look at. Last edited by flashover : 02-08-2007 at 15:42. John, that keiv looks amazing in black... i would have bought the one in the classifieds had I known how great it looks in black! About the only one that is left. But I could show you a few that "got away"
this was the one that was in the Classifieds a week or so ago. I am thinking of the Navy Blue Lizard from Aki-Asahi. 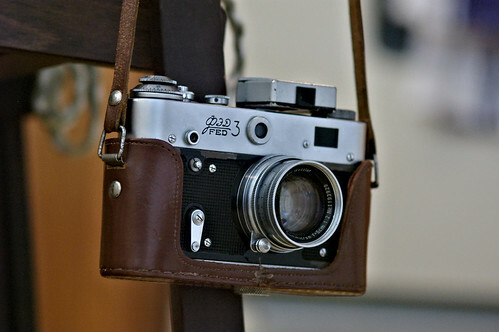 My Zorki 1 purchased from Oleg last year. Yay ... it's about time we had a thread for us Rusky fans ... well done! My Fed 2 dressed in Luigi clothes ... and under KGB interrogation in black and white! 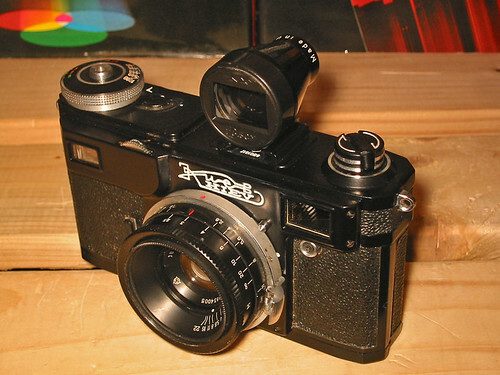 My Fed 3b...my first RF. It has a great musty smell! "The cup of tea on arrival at a country house is a thing which, as a rule, I particularly enjoy. I like the crackling logs, the shaded lights, the scent of buttered toast, the general atmosphere of leisured cosiness." Glad I can get in, on the first page of this one. How is the spacing between neg frames? We find our Destiny on the road we take to avoid it. Last edited by mike goldberg : 02-09-2007 at 10:21. Last edited by dazedgonebye : 02-09-2007 at 10:30. 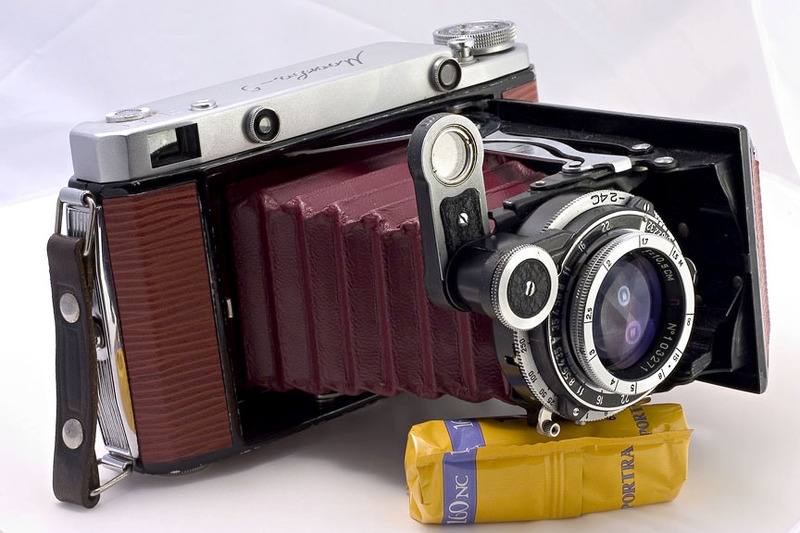 It is a FSU 35mm finder ( no Bright lines ). that was meant for the J12. I also have a Helios finder that covers 25,85 & 135. How do you like the CV 75/2.5? Last edited by mike goldberg : 02-09-2007 at 11:12. I like the CV75 very much. I've gotten some sharp shots out of it, but nothing worth sharing (my fault, not the lens). In the interest of veering back on topic...Moskva 5. Black Kievs look great with a blue suit.... (click). I'm sure it will look even better with a little lizard texture. -edit- pics of my Kiev's can be seen by clicking on them in my sig. Of all the Russians Zorki 4's have most character!! O, русских красоток! О, уродский ГАЗ! This thread will surely be the final nail my Paypal coffin! I'm actually thinking about selling my Kiev's(but now maybe only one) but, after looking at all of these photographs of FSU's I don't know what to do! Going through this thread just makes me sad to realise that there's so many cameras I could yet own ... and if I don't stop browsing ... may! Last edited by Keith : 02-09-2007 at 16:26.
here is my kiev II back again from repair. 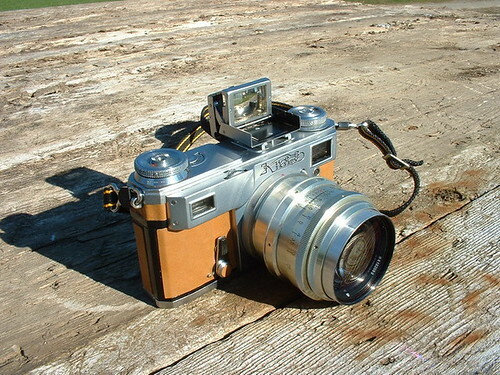 What is that cute little one......and where can I get one to go with my XA? I bought it in working condition for 25$. The shutter fails after 15 shots with first roll . It was't opened since production. The second curtain stayed unhooked, one of the ribbons was near broken and the shutter mechanism was broken. The repair costs 10$ and now its like new! I love it. Here is my blue Fed-2. My Zorki-4K, recovered with a kit from Asahi. My Zarya found in 2005 in a tiny shop in Prague, boxed with instructions for £30. Hey, Welcome to RFF, feyz! There's absolutely nothing wrong with your English or your Kiev. Very nice! I guess I'm going to have to start shopping 'round for a new computer. This one is obviously gone belly.up. On my monitor, all these decrepit ol' shooters look ready to go!! Last edited by reagan : 02-10-2007 at 08:08. Not the last one that I have bought, but a real nice user. Tried on a non-vintage lens. (forgive me, I am so weak, a serial GAS victim). That was a good price for a '64 in nice condition. By the time I got the light leak taken care of I'd gotten to tired of the thing to look at it. I sold it to a member here. I replaced it with my Iskra...which has a light leak.